UFP Technologies has the resources to support protective case solutions for homeland security, military, aerospace and defense applications. Our inventory of, and access to, military specified cases and packaging foams, coupled with our national footprint, provides manufacturers for the aerospace and defense industries an optimal protective case solutions provider. UFP Technologies has access to a wide array of protective cases and packaging foams that have been previously tested to meet military specifications. We produce our turnkey protective case and insert solutions solely in the United States. Of UFP Technologies' eight North American locations our Decatur, AL, Kissimmee, FL, Addison, IL, Georgetown, MA and Raritan, NJ manufacturing facilities each have a CAGE Code assigned. For homeland security, military, aerospace and defense applications UFP Technologies has had success in producing protective case solutions for range of applications including gas sensor devices, communications equipment and weapons systems. UFP Technologies specializes in producing custom cases for guns, pistols, firearms and accessories. 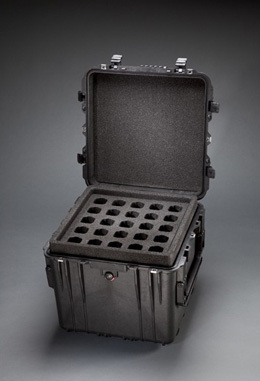 Our engineers can design a custom insert - that provides a perfect fit to your firearms, ammunition, scopes and other accessories - using a lightweight foam that provides protection and the mobility necessary for homeland security and military applications. Transporting expensive electronics equipment, such as communications equipment and delicate life saving devices, out onto the field can be a worrisome task if it is not properly protected. The image to the right is a case system UFP Technologies developed for a police department who was in need of transporting 50 of their handheld radios. Inside this case are two identical foam inserts, stacked atop of one another, each providing a perfect fit for 25 handheld radios. For extremely sensitive equipment like microchips or circuit boards, anti-static foams that protect against electrostatic discharge can be used. If purity or out-gassing is an issue, crosslinked foam expanded with nitrogen can provide a safe solution. 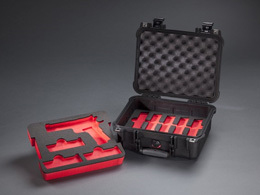 UFP Technologies created a foam tool control solution for a combined mobile tool kit contract with Armstrong Tools, a division of Danaher Corporation and Pelican™ Products, Inc. for the United States Army and Marines that meets stringent Berry Amendment “Made in the USA” requirements. 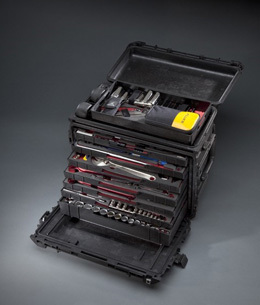 The joint mobile tool kit called the General Mechanics Tool Kit (GMTK) is a portable solution for transporting and storing tools used by members of the US Army and Marines around the globe. UFP Technologies' portion of the GMTK is to provide protection for the tools inside the kit. A multi-color tool control tray made out of closed cell cross-linked polyethylene foam was developed. The tool trays have been engineered and fabricated to custom fit each tool in the kit. A two-color shadow box system was used to emphasis tools missing from the kit to enhance productivity, practice tool accountability and most importantly, to prevent foreign object damage (FOD). UFP Technologies can provide a unique tool control foam solution to be installed inside of a protective case. In addition to the two-color shadow box foam, UFP Technologies can print or laser etch tool names and part numbers to identify each pocket to its corresponding tool.